The Buzz: Thumbs Up, Kathy! Hello Friends! My card share today is part of another card drive of sorts. There is a group of us card making gals on Instagram that are collaborating to create cards in support of Kathy Racoosin, the host of the super fun 30 Day Coloring Challenges. Recently, there have been some unkind people visiting Kathy's YouTube channel and we wanted to show her that we appreciate what she's doing! If you've been following along with my blog, then you'll know that I have BIG love for Kathy. She not only coordinates the 30 Day Challenges but, she also creates a project and usually a video for us each day of the challenge. She shares her tips and techniques and gets us inspired to color something for the day. In addition to that, she takes the time to comment on all of our posts, either on our blog or on Instagram. Can you imagine how much time that takes?! This is no small thing, these 30 Day Coloring Challenges. Google it and you'll see. All levels of colorists participate, from beginners to coloring masters, including recognizable names, such as Jennifer McGuire, Sandy Allnock and Kristina Werner, to name a few. I've made a lot friendships through these challenges and I have been inspired by some wonderful people and it's all because of Kathy's genius idea; To get us all to take a moment out of our busy day, to spend five minutes doing something for ourselves that makes us happy and brings us joy. And Kathy does all of this out of the kindness of her heart for FREE. 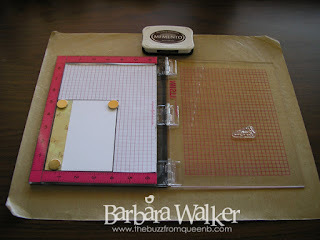 I started with a stitched rectangle die cut panel of Tim Holtz Distress Watercolor Card stock. I stamped the sunflower with Versamark ink and embossed it with fine detail white embossing powder. And as usual, I worked on the textured side. 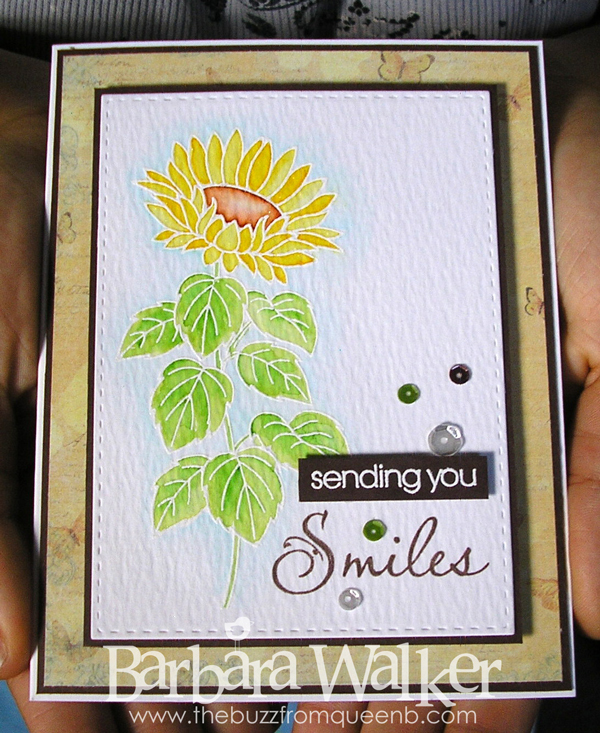 I especially like the texture with the sunflower. Then I watercolored it with my Ziggies. 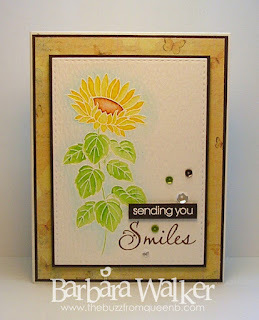 After the panel was dry, I used my MISTI to stamp the "Smiles" and the inside sentiment which says, "Girly, You Rock!" Then, I matted it with Dark Chocolate card stock and adhered it to my card base with a piece of craft foam. 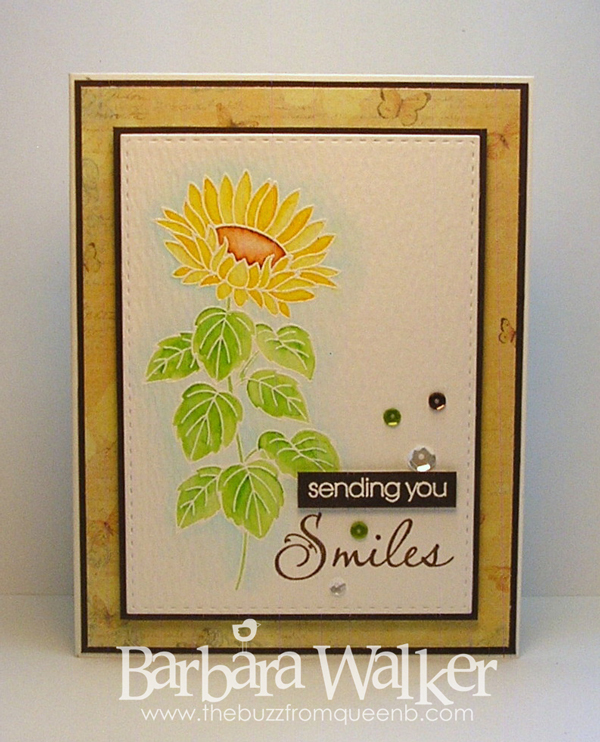 I went over the sunflower with a Clear Wink of Stella glitter brush to add a bit of sparkle. Then, I added a sentiment strip, also white embossed on Dark Chocolate card stock. I finished off the card with a sprinkling of Pretty Pink Posh sequins. I don't know if Kathy will see this post or not, but...Kathy, keep being you and keep doing what you do! You get a "Thumbs Up!" from me! And that is it for me today. Thank you for stopping by. I appreciate the visit. Have a wonderful weekend! Beautiful card for a beautiful person, Barb. How kind and thoughtful of you and the other ladies to support and encourage Kathy in this way. I'm sure she will be very touched by your encouragement and support. Your card is wonderful. I usually stamp on the smooth side as I have worried that I wouldn't stamp cleanly on the rough/bumpier side. Maybe I need to try it though as the texture looks neat. Thanks for sharing all that you share Barb! 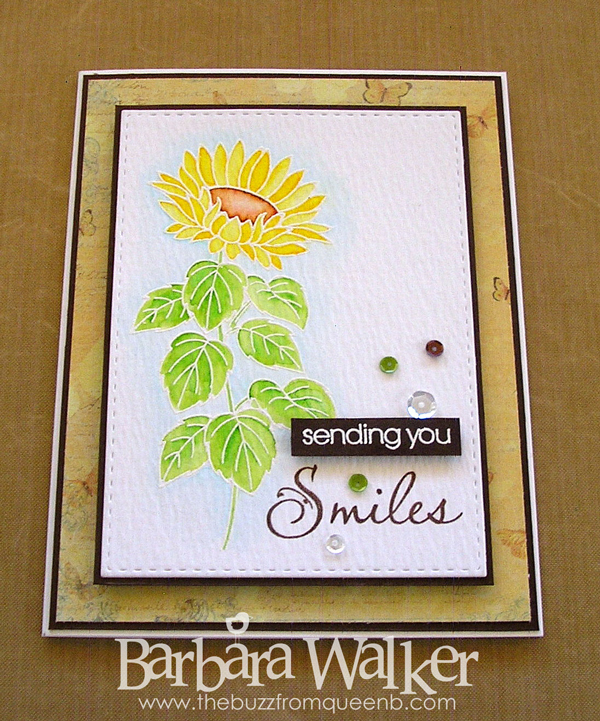 Barbara, I love your card, and it's beautiful! I too am a big Kathy Racoosin fan and love her 30 Day Coloring Challenges. And I also love the other wonderfully talented gals, among others. What inspiration! You too inspire me with your beautiful work. Beautifully colored, and I love the Dark Chocolate matting. Stunning, sweet friend! (Now I really should go color something, right? Smile!) Hugs! What a beautiful card. Your water coloring is gorgeous and I love the sentiment. How sweet of you and the others to do this for Kathy. I love your card. It makes me want to run and pull out my watercolors. I just got my MISTI in the mail yesterday so I can't wait to give it a go. Thanks for the visit on my blog a few weeks back. Have a blessed day!